We are delighted to welcome Hermann to the Wobage course programme 2014. Hermann started his career with a three year apprenticeship at Winter-Andres Pottery in Gmund, Bavaria. He then worked for 2 years as a maker & assistant teacher at the International School of Ceramics in Tuscany with Piedro Maddalena. A further 2 1/2 years were spent working as a thrower at Bandon Pottery near Cork / Ireland and then at Dartington Pottery, Devon, UK. After his travels Hermann completed the German craft education with a half year ‘Meister’ course at the ceramic school in Höhr-Grenzhausen. In 1997 Hermann returned to his homeland, the North Friesian island Pellworm, Germany, with his partner Rachel Kyle also a potter and previously a Wobage maker! 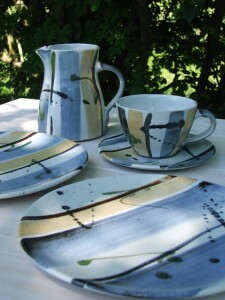 Here they make their own individual ranges of decorated reduction-fired stoneware and porcelain.